One of the reasons why I look forward to Diwali every year is because it is around this time of the year that a John Grisham novel usually comes out. Apart from the Theodore Boone novelettes, Grisham usually writes and publishes one novel a year. His 2013 offering is Sycamore Row. Grisham’s first novel – A Time to Kill – had come out in 1989. 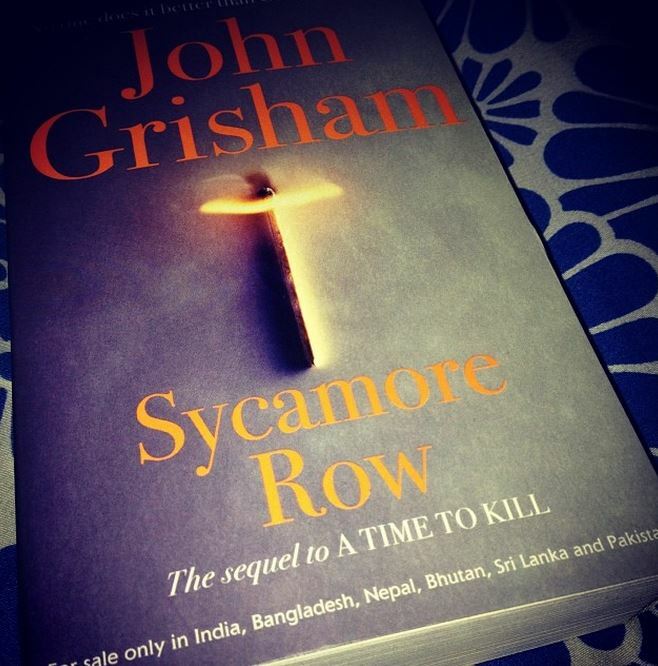 The cover of Sycamore Row says that it’s a sequel to A Time to Kill, a novel that got Grisham instant fame and accolades. However, this new novel is hardly a sequel; it is merely a new story in the life of the old characters. The past couple of years have been the ‘age of sequels’, so to say. We’ve seen numerous movies that are actually new stories, but are called sequels of blockbusters. It’s just a fad that has come out to cash in on the popularity of a previously successful offering. Like in the case of most sequel movies, especially the ones from Bollywood, the story of Sycamore Row has nothing to do with the story of A Time to Kill. I’m glad Sycamore Row isn’t called A Time to Kill -2. That apart, as a standalone novel, Sycamore Row is Grisham at his brilliant best. Our hero – Jake Brigance – won a case for a black man in rural Mississippi in Grisham’s first novel. This time, in the same race-driven setting, he’s defending the will of a white millionaire, who’s left a major part of his estate to his black housekeeper. Seth Hubbard is eccentric, but why would he still leave 90 per cent of his assets to Lettie Lang, a black housekeeper who has worked for him for only 3 years? Why would Seth completely cut out his kids from his will? Why would he hire Brigance, a lawyer he’s never met, as the attorney of his handwritten will that he’s written just a day before he commits suicide? These are the questions that the story answers. And thrown in the mix of things is Ancil Hubbard, Seth’s younger brother who hasn’t been around for ages. There’s a history behind Seth Hubbard’s will, and Grisham keeps the reader hooked till we find out what it is at the very end. Sycamore Row has a plethora of characters that we know Grisham for. From the hard-nosed judge to the villainous lawyer on the other side, from the arrogant, white city-dwellers to the humble, black townies, Sycamore Row has everything you’d expect from a Grisham novel. Of course, there are the tiny satirical bits that I love, little pieces of insights that make you laugh. On the whole, Sycamore Row is a good read, albeit nothing exceptional. It is predictable in a way, but interesting enough to keep you curiously riveted. Among Grisham’s newer works, it’s still not as good as The Confession (2010). But, it’s a very good story and you won’t like to put it down till you know what happened at sycamore row.